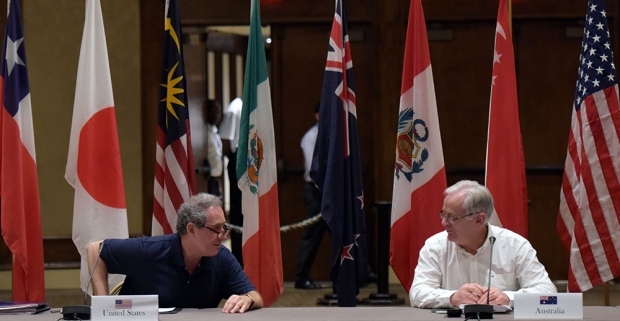 U.S. Trade Representative Michael Froman and Australia’s Trade and Investment Minister Andrew Robb attend a July 2015 round of Trans-Pacific Partnership ministerial meetings in Hawaii. Yoichi Funabashi is Chairman of the Rebuild Japan Initiative Foundation, a Tokyo-based think tank. The Trans-Pacific Partnership (TPP) is a big deal, in all senses of the word. It is the most important trade deal negotiated in over 20 years, and it also represents a new effort to agree on a range of “behind the border” regulatory issues that go well beyond traditional trade issues. It is huge and complex and, inevitably, almost everybody can find something in it to dislike. First, the TPP shows the U.S. and Japan exercising leadership, stepping out ahead of the global community in their willingness to negotiate a new set of rules and obligations. This dynamism presents challenges to China. It creates the possibility that the future rules for the global economy will be written under predominant U.S. influence, in the same way that the current rules have been. That makes China extremely uncomfortable, and it also pressures China to come up with alternatives that will be attractive to its neighbors while also serving its own interests. Second, the TPP shifts economic balances and alliances within Asia. The TPP greatly increases the likelihood that Japanese Prime Minister Abe will carry through on Japanese economic reforms, therefore making economic revival there more likely. The TPP will pull Vietnam (especially) and other signatories economically closer to the U.S., and thus reduce Chinese economic preponderance. Given that South Korea is likely to quickly join in any completed TPP agreement, these shifts can have a long-run economic impact on China. Third, TPP increases the pressures within China for more decisive economic reforms. China launched the Shanghai Free Trade Zone (FTZ) two years ago, partly in order to pilot measures of external liberalization that would be useful in a new round of reform. The possibility that TPP would be agreed to was a consideration, and part of the impetus for the Shanghai FTZ. However, the FTZ has so far under-performed expectations. Now, the TPP will present Zone officials with a clear benchmark of world “best practice.” It will give advocates of economic reform within China a new argument to support more substantial opening measures after a bad year. The TPP challenges China to up its game in economic opening, regulation, and economic diplomacy. If China chooses, TPP can be the catalyst for a new round of global engagement that China sorely needs. For the most part I concur with Barry about the scale and importance of the TPP, and the challenges it poses for China both economically and strategically. I’m not sure I agree, though, that it will do much to “reduce Chinese economic preponderance” in the region. That preponderance is driven by China’s sheer size, its continued growth—which though slower than in the past is still faster than that of most other Asian economies—and its increasing centrality in global supply chains. Moreover China has its own strategy for increasing its influence, through the infrastructure projects under the “Belt and Road” umbrella, which will be funded by Chinese policy banks and the Chinese-led Asian Infrastructure Investment Bank. The impact of the Belt and Road initiative will likely be felt more immediately and concretely than the effect of the TPP, many of whose features will phase in slowly over several years. Moreover, the TPP illustrates a dilemma for U.S. policy in the Asia-Pacific. On one side, Washington seeks to counterbalance China’s rising power by strengthening its military relationships with its regional allies, tilting in favor of southeast Asian countries in their maritime disputes with China, discouraging its friends from participating in Chinese initiatives such as the AIIB, and pursuing a massive trade agreement that leaves out the region’s and the world’s biggest trading nation. On the other side, American leaders reiterate that they have no desire to “contain” China (rightly seeing such a strategy would fail), and argue that deeper engagement, rather than confrontation, is the right way forward in U.S.-China relations. This stance is borderline incoherent, and it’s understandable why many Chinese see it as duplicitous. Washington’s words are all about constructive engagement, but its deeds mostly smack of containment. At the root is a deep ambivalence about whether or not the U.S. should accept China as an equal. If it does, then it must also accept that China will build a sphere of influence and regional arrangements that exclude the U.S. If it does not, then it must accept that in fact if not in name it is pursuing a strategy of containment. Such a strategy heightens the risk of armed conflict. For the moment, China and the U.S. still mostly conduct their relations on a basis of economic pragmatism rather than strategic rivalry. But the ground is rapidly shifting. The completion of the TPP sharpens the question of how the U.S. and China will share power in the Asia-Pacific, but provides no answer. Is the TPP really such a big deal? Of course, we can’t know until the full texts of the agreement are published. But from what has leaked out so far, it seems to be so economically in only one respect: it provides a backdoor way of creating a bilateral free trade agreement between the U.S. and Japan, which might have been politically difficult otherwise, and of bringing Japan more deeply into a network of FTAs with other east Asian countries. That should also put some welcome external muscle power behind Prime Minister Shinzo Abe’s third arrow, which has risked looking slightly pointless. However, as a trade-liberalizing arrangement, the TPP doesn’t otherwise look so impressive. Six of its members already have FTAs with the U.S., so for them any improvements in market access are likely to be fairly limited. Vietnam stands to gain quite a bit, though its benefits will be limited by constraints imposed at the demand of the U.S. textiles lobby. And liberalization is likely to be phased in gradually. In the end, trade may be a bit freer within the TPP, but it will be far from completely free. What of the much-ballyhooed rules that, TPP supporters say, make it a path-breaking 21st century trade agreement? It is certainly true that a number of them go beyond World Trade Organization rules and provisions in other regional or bilateral deals. But that does not necessarily make them either trade-liberalizing or desirable. Some, indeed, look less like fair and equitable guidelines than sops to U.S. special interest lobbies whose support the Obama administration needs if the TPP is to be ratified by Congress. Labor standards provisions in the TPP would meet long-standing demands by the AFL-CIO, hardly a free trade champion, while it is far from clear how international trade liberalization would be served by granting U.S. industry demands for patent extension—demands that aroused objections from many other TPP countries. President Obama’s claims that the TPP will enable the U.S. to set the rules for global trade also look more than a touch hyperbolic for other reasons, too. For one thing, to do so would require China’s assent. But why should China sign up to U.S.-prescribed rules on labor or environmental standards, with no guarantee of obtaining reciprocal trade benefits from the U.S. that Washington would undoubtedly find politically difficult to deliver? For another, to be truly global, rules would require the acquiescence of the European Union. Yet attempts by Washington and Brussels to achieve common regulatory ground in negotiations on the Transatlantic Trade and Investment Partnership are progressing very slowly, and in some areas the gaps between the U.S. and Europe appear to be widening, not narrowing. For all these reasons, China may feel it can afford to take a relaxed attitude to TPP. In any case, it now believes initiatives such as One Belt One Road, the AIIB and RCEP, its own regional trade plan, have given it options. In addition to which, as Arthur points out, it is far from obvious that Washington has a coherent strategic vision of how the TTP fits into its concept of its relations with China. The Trans-Pacific Partnership (TPP) is not, contrary to some recent commentary and contrary to Chinese suspicions that Barry Naughton is right to point out have mostly subsided, a “No China Club.” Though it is hard to discuss the detailed implications for China without seeing the actual text, we can consider what the agreement announced Monday represents for China’s position in trade negotiations. Second, China would have had to undergo substantial reforms in the state-owned sector, labor standards, and other areas—reforms that go well beyond China’s own Third Plenum reforms that many analysts see as lagging. In essence, China wasn’t ready for TPP negotiations even if it wanted to join. Only once the full agreement emerges can we assess the likelihood of China ever joining the TPP, but if the Chinese leadership is successful in pursuing its own reform agenda, it will be in a much better position to enter talks to join the TPP. Third, there remain paths for convergence in trade that do not require China to join the TPP. If China and the United States conclude an ambitious bilateral investment treaty (BIT), experienced trade negotiators have said the BIT could play a role similar to WTO accession in providing an international carrot for internal Chinese reforms. Then there is China’s support for a Free Trade Area of the Asia-Pacific (FTAAP), originally supported by the United States but recently deemphasized (perhaps until the TPP is safely enacted). A FTAAP would include all APEC economies, which means every member of the TPP plus several others. Critically, the FTAAP would at this point not include India, whose inclusion would pose further, perhaps insurmountable, challenges on issues such as food subsidies. (The China-led Regional Comprehensive Economic Partnership (RCEP) does include India, and for that reason reaching a deal would be challenging and convergence between RCEP and TPP is unlikely.) If TPP goes into force, work could turn toward the BIT and, later, the FTAAP—allowing China to enter an agreement with the TPP economies without having to agree to provisions that might be deal-breakers. Finally, we should not get ahead of events in assessing implications for China. The U.S. Congress could still hand Obama and the TPP negotiators a defeat (or a long delay). The economic and political implications for China hinge as much on implementation as on the content of the deal. This ChinaFile conversation is premature, since the texts of the agreement are a long way from being released to the public and the Congress. Headlines aside, it would have been better to wait until the full TPP documents were on the table. For now, only a few place-holding comments seem appropriate. It remains to be seen what will ultimately yield passage or defeat of TPP in the U.S. House, and the utter dissolution of majority-party organization in the House at this very moment suggests a further destabilizing element in predicting outcomes as long as a fifteen months from how. Others have noted the obvious point that, if every Member votes on the dissatisfactions of those in his/her District, as most of the debate unfolds during a superheated national election campaign in which moderation (in support of good policy) is a vice, TPP will not pass. What is ironic on this, given that we’re writing for ChinaFile with its focus on China, is that, although China is not a party to the TPP agreement at all, I suspect we will see (or maybe not see, if people hide their tracks) that more than a few seasoned members of the U.S. China-watching community will wind up agreeing (albeit in less incendiary form) with the Obama administration argument in defending TPP along the way, i.e., that this agreement is far better for the U.S. than anything that would emerge in a more heavily PRC-oriented Asia-Pacific region if the U.S. turns its back on its negotiating partners large and small. Maybe the denizens of "The China Field" in the U.S. will be said to “lack standing” in the debate that follows on TPP because China’s not in the Agreement. But I suspect some hardy and respected voices in “The China Field” will line up with the Administration, as much out of an increasingly gimlet-eyed view of PRC inclinations and behaviors in recent years as out of affection for the specifics of the TPP itself. Thus, who gets to which Members of Congress with what messages, and at what critical moments, will matter a lot. But again, this is all premature until the Congress and the rest of us have something to look at. I agree with Barry’s statement that the TPP agreement could potentially elevate the likes of the U.S. and Japan into a position where they can take a lead in writing the rules of the global economy and setting the regional agenda. Concluding the agreement has been long overdue. In the meantime, Beijing has been pressing ahead with laying the foundations for its own vision of the regional order—a Sino-centric one. This has been backed by the establishment of institutions such as the Asia Infrastructure Investment Bank (AIIB), which provides an alternative to the existing multilateral development organizations and challenges the Bretton Woods System. China is shifting from a rule-taker to a rule-maker. The TPP pushes back against this and thus has strategic significance, which goes beyond a vehicle for trade liberalization. Becoming an issue of order over the economy has allowed President Obama and Prime Minister Abe to invest political capital into the deal. In particular, the TPP is a key testing ground for the U.S. to embed its status as a lasting power in the region. To date, the U.S. rebalance policy, formerly known as the “pivot to Asia” has been accused of being empty rhetoric and having an overly military focus. Regional allies have been skeptical and called for reassurances. The TPP gives the rebalance a broader foundation and much needed credibility. It is no surprise that the U.S. Secretary of Defense Ashton Carter has likened the importance of the deal to “another aircraft carrier”. What the TPP means for China is that Beijing’s dream of a G2, “new type of great power relations” with the United States will not be accommodated. First, the deal strengthens the U.S.’s regional ties and should stimulate their economic growth— precluding their marginalization. For example the U.S.-Japan Alliance will gain new impetus through closer economic integration from a trade deal that has so far been lacking in the relationship. Second, the TPP provides a broader Asia-Pacific regional framework within which the U.S. and China can manage their relations. Therefore, the strategic challenge is to facilitate China’s accession. Next, the TPP advances the march of competitive liberalization. The Regional Comprehensive Economic Partnership (RCEP) has been widely considered as a less ambitious counter FTA that suits China’s attempts to build a sphere of influence in Asia, to the exclusion of the U.S. The TPP will set new global standards and norms that will encourage initiatives such as the RCEP to develop in a similar direction to remain competitive. In other words, it urges China to rise as a rule-abider rather than as a revisionist. Beyond China’s regional concerns the TPP also has domestic implications. China’s leaders will be heaped with fresh external pressure to hasten economic reforms that have reached a crossroads. This year’s market turmoil and large capital outflows are signs that cracks are beginning to appear. The Chinese economy is in need of oxygen from the outside and this is what the TPP can offer. For China, the TPP should be seen as a golden opportunity to avoid the middle income country trap.